Susan Bednar held her coffee cup in one hand and her pet poodle in the other as she watched the scene unfolding in her front yard with a noticeable sense of satisfaction. Michael Bentley poses with homeowner Susan Bednar following completion of this yard project. 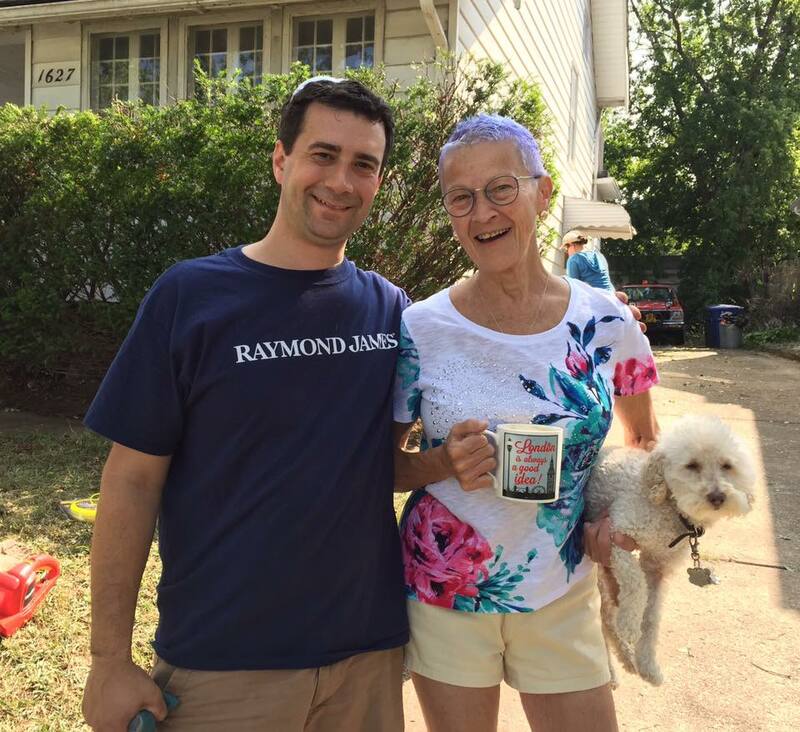 LakewoodAlive’s Housing Outreach Program recently partnered with Bentley Wealth Management of Raymond James, a locally-based financial services firm, to assist Ms. Bednar with reclaiming the yard surrounding the Warren Road home she’s occupied for several decades. 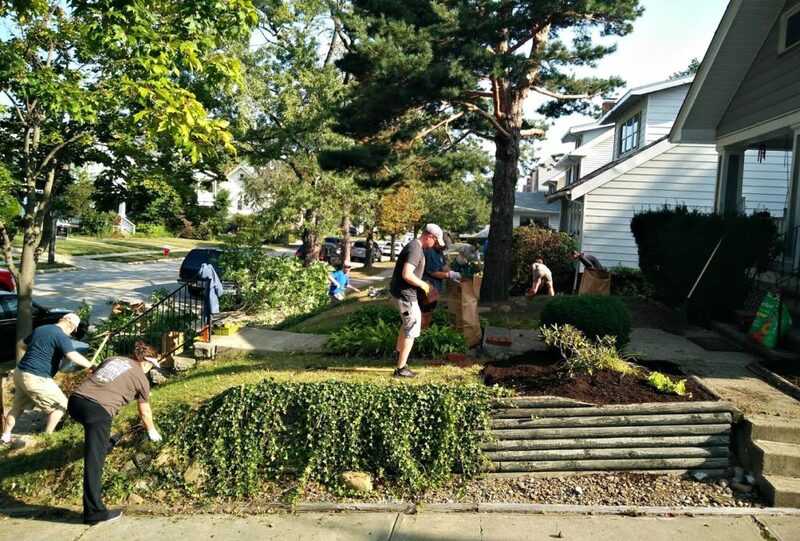 LakewoodAlive board members and other Lakewood community members also contributed to this massive volunteer housing project, which included a similar yard beautification effort at the home of Ms. Bednar’s next-door neighbor. Collectively, these 20 tireless volunteers spent a Saturday morning completing a pair of whole yard makeovers. The hum of various pieces of power equipment reverberated through the morning air as volunteers trimmed bushes, removed debris, weeded, raked and mulched. Ms. Bednar has always taken great pride in her yard, devoting significant time to landscaping. Within the last decade, however, the longtime Lakewood resident had fallen upon hard times. The death of her mother preceded a diagnosis with ovarian cancer. Three operations and one hip replacement later, Ms. Bednar’s cancer is in remission but she struggles to maintain her home. LakewoodAlive’s volunteers work to beautify this pair of homes on Warren Road. A phone call to LakewoodAlive in 2015 spurred a connection with Housing Outreach Director Allison Urbanek and, more recently, with Community Engager Mark McNamara. LakewoodAlive’s Housing Outreach Program has since assisted Ms. Bednar with obtaining a new roof and various other housing needs, laying the groundwork for this yard reclamation project. 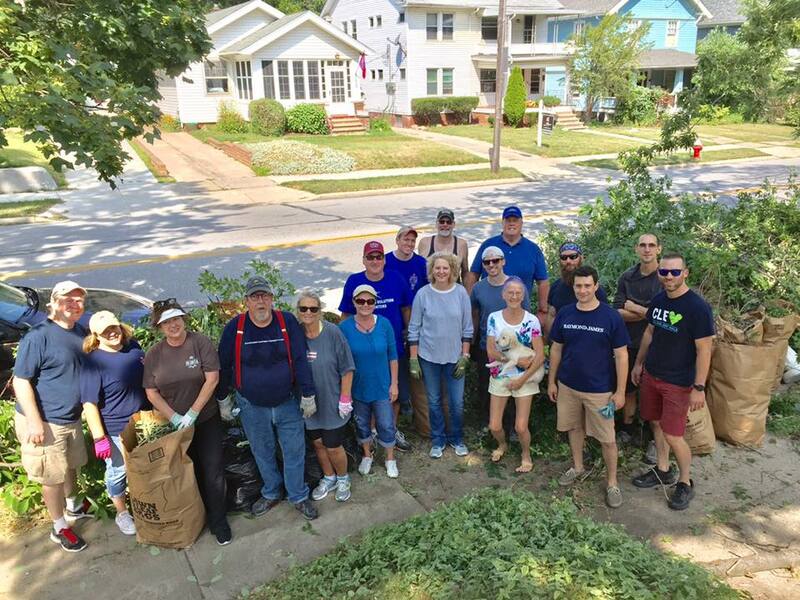 For Michael Bentley – Vice President, Investments for Bentley Wealth Management of Raymond James – and his crew of fellow volunteers, the experience proved extremely rewarding. This marks the second consecutive summer the group has teamed with LakewoodAlive to assist Lakewoodites in need by completing a volunteer housing project. And this time the weather cooperated beautifully. The pair of beautification projects represent the 35th and 36th such undertakings completed by LakewoodAlive thus far in 2017. For more information regarding LakewoodAlive’s Housing Outreach Program, contact Allison Urbanek at aurbanek@lakewoodalive.com. A superb group of volunteers poses following the completion of a job well done.